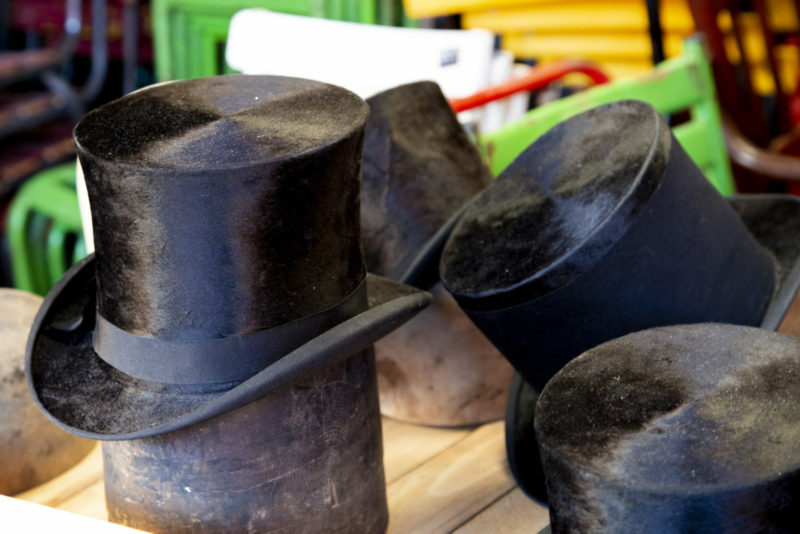 Every time I get myself to a flea market I fall in love with the adventure. It’s eye candy for my soul. The people, the collections, the eras of goods and novelties throughout the world right in front of me to explore. 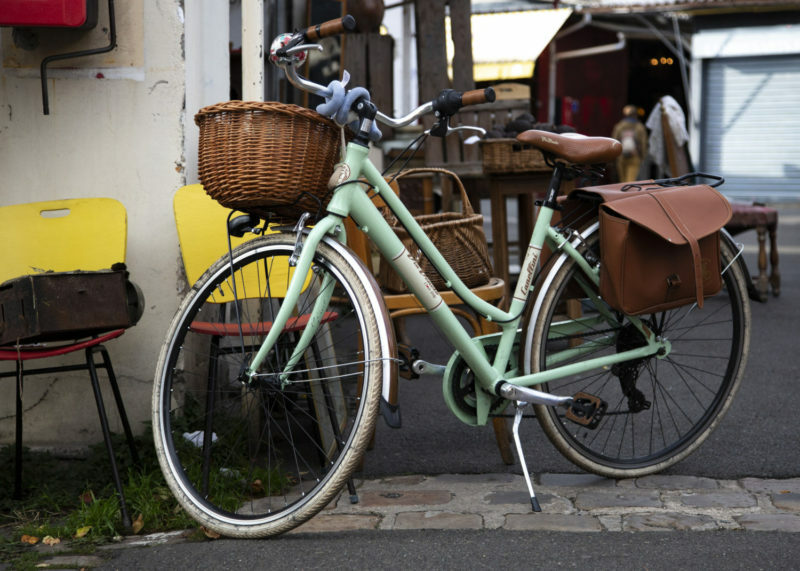 Lately, I’ve been hitting auctions and flea markets on the Eastern Shore of Maryland but recently had the chance to explore one in… Paris! Yes, Paris. What an amazing adventure that satisfied every sense of my body. I have no idea if “flea market clubs” exist like let’s say book-clubs, but I definitely think there should be! That might have to be something I explore as my early retirement years become closer. Or maybe, the photography club I’m with can expand into this too. I know a few members that would be all over it. If any of you know of a club like this, kindly pass on the information to me. I don’t have an inch of space for finds but it’s the experience that I enjoy more than findings collected. I just love the happenstance of the the frenchman fishing on the wall, the toilettes sign, umbrellas on the kiosk stand and bike propped on the building. 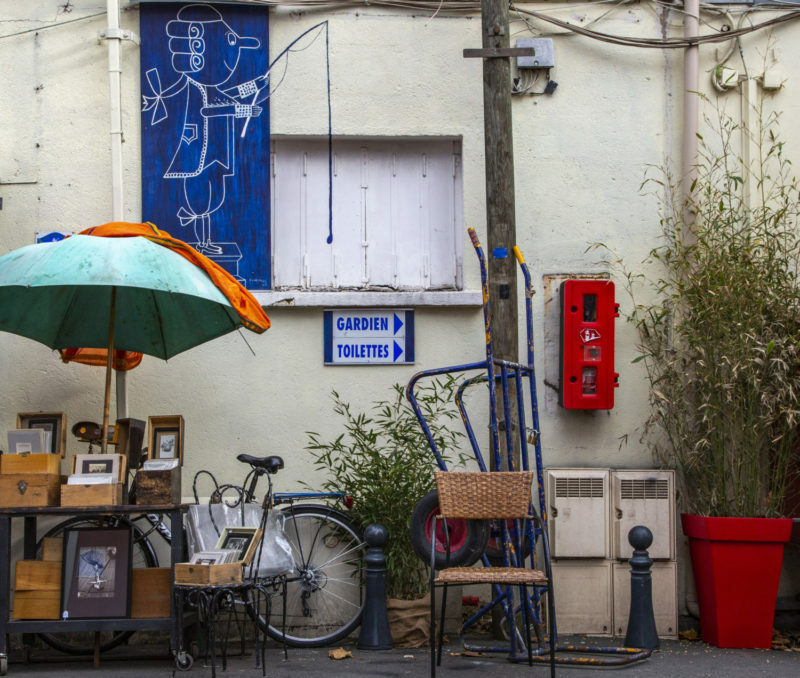 It made for a great photo that represented the whimsy of this Parisian market. 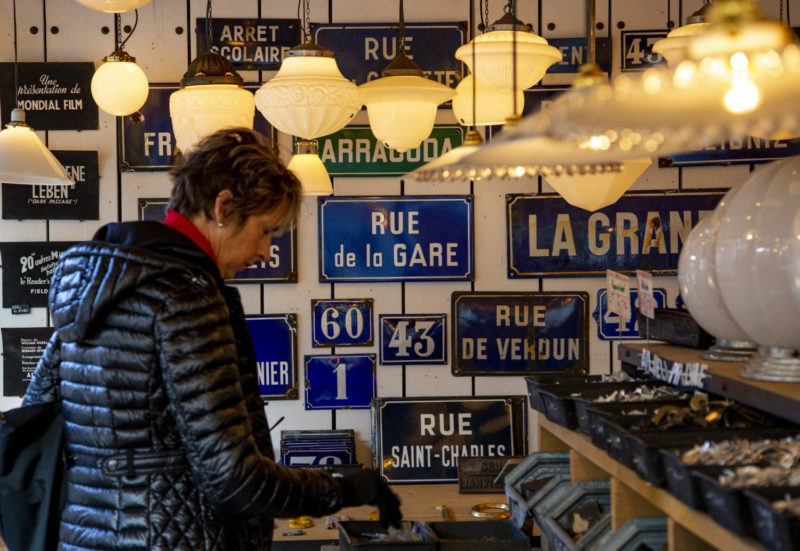 The variety of collections in Paris markets was like no other I’ve even experienced. The quality of the the enamel plaques and old lights found in this booth display the passion and expertise of the collector and owner. 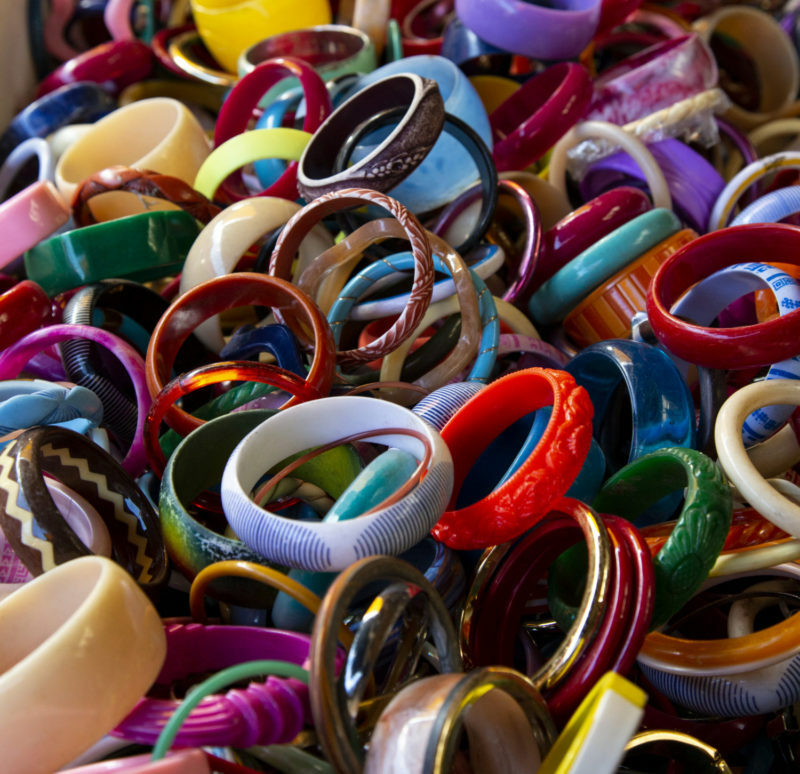 Bangles anyone? This old bathtub was literally filled to the rim with quality and colorful bangles of all styles. This happened to be a favorite spot of mine as I ventured through the market. 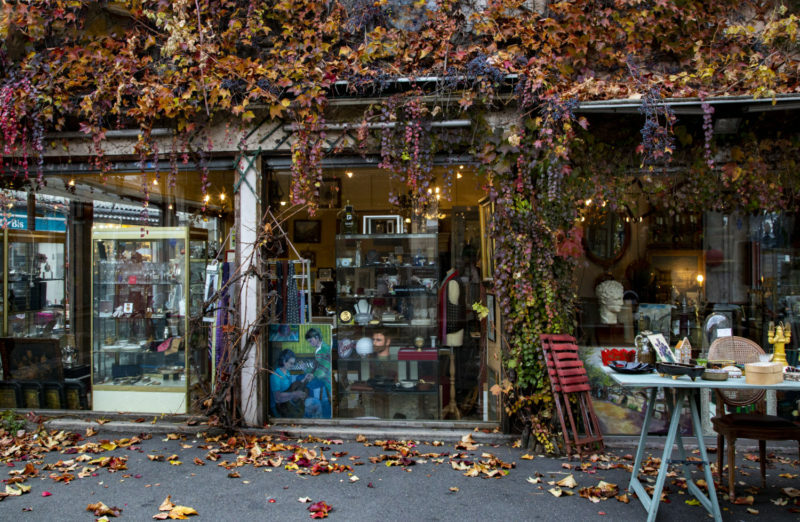 Not only was it charming from the outside with fall colored vines framing out the corner of this market, the goodies inside were high quality finds at affordable prices.